One of the great seasonal dishes, butternut squash soup is perfect as Fall ramps up, the leaves change and the pumpkins come out. This version of butternut squash soup is creamy and delicious and makes a great starter to an autumn meal. You'll see the video above, that I added a bit of coconut and curry powder to that version - one of my favorite ways to change things up. However, my classic version below, remains my favorite. I start out by roasting off the squash which helps to concentrate the flavors that will eventually come out in the soup. A bit of chicken stock, some onion, garlic and few other ingredients, and your good to go. It only take about an hour to make, although all your friends will think that it took you half a day to put together. And of course, I'm sure you're going to love it! 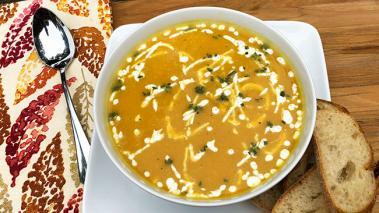 This recipe for butter nut squash soup has 3 major steps. The first is to cut and roast the butternut squash so that the water evaporates from the squash and the edges begin to caramelize which will create a more concentrated flavor in the final product. The second step is to make the soup base with the mirepoix and other ingredients, and the final step is to blend the soup to create a smooth creamy texture. The first and probably hardest step in this recipe is peeling the squash. The skin of the squash is thicker and tougher than an apple and the squash’s shape can make it a bit tough to handle. The simplest way to do this is to use a potato peeler to remove all the skin, however with a little experience you can get it done faster using a knife - Check out this video for a quick demo. Once the squash is peeled, cut it in half, and remove the seeds, then dice the squash into cubes that are about 1.5 inches on each side. Toss those pieces in a bowl with olive oil, salt and pepper, and then spread those pieces on a baking sheet. I line the sheet with aluminum foil for easy clean up. While the butternut squash is roasting prepare the soup base by dicing the carrot, onion and celery into the same size dice. With a ladle, transfer the soup to a blender, making sure there is enough liquid (along with the solids) to allow the blender to do its thing. Be careful blending hot liquids in a blender as they can come bursting through the top. I hold a towel over the blender and start with very short/quick pluses to get started. There a several different ways to serve the soup. I like to serve it hot, with a drizzle of olive oil, and some fried sage leaf on top. But other great garnishes include: sour cream, chili oil, chives, truffle or truffle oil, or anything else you like. Sir, My bad! I have seen the 2 apples listed. No idea how I missed them the first time around.